bass bridge; C-F# (19 notes) bichord wound copper on iron core. The cabinet fortepiano was created in an attempt to provide for bourgeois houses an instrument midway in quality and power between the ordinary domestic “square” fortepiano and the concert “grand” instrument. The Schureck Collection contains the earliest known surviving example of this peculiarly English creation, also by Broadwood (No. 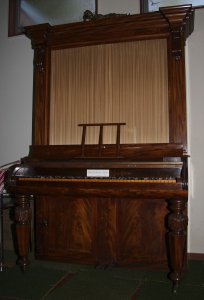 102, of 5-1/2 octaves, from c.1805); this instrument, adjacent to the dining room, is awaiting restoration. The present instrument represents, in contrast, the final stage in the cabinet fortepiano’s evolution, before its replacement by the “modern” upright, essentially the creation of Robert Wornum in 1844. The name label describes Broadwood’s as “Manufacturers to Her Majesty,” and Mendelssohn would frequently have played such instruments in his private concerts for the young Queen (acceded 1837) and her Prince Consort; however, such fortepianos are eminently suitable for the whole piano literature of the early nineteenth century, from Beethoven to Schumann, and tonight’s concert presents this music as it might have been heard in a fashionable London town house around mid-century.